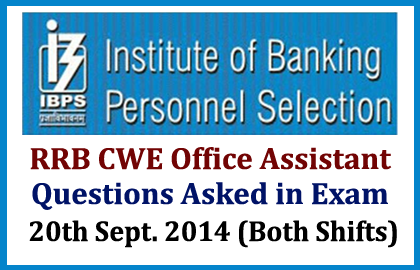 List of general awareness questions asked in IBPS RRB Office Assistant Exam held on 20th September 2014 both shift. Candidates those who are preparing for IBPS and other bank exams can make use of it. Who is the current CM of Bihar? What is the initial capital amount to start a bank? In august first week Narendra Modi has visited which of the following countries? How many new AIIMS institute were decided to start as per Budget 2014-15? Rory Mcllroy, was related to which of the following sports? Who is the founder of Congress? Where does the Gulberg Hill station was located? K.R.Kamath was the CMD of? Which is the fastest train route in India? Which of the following country achieved highest GDP in 2001-2010? Who is the current railway minister? Who is the head of press council of India? Which of the following sports was related to the word”Double Fault”? Who is the current IMF head? What is the current SLR rate? Oslo was the capital of? Bank of Rajastan has merged with which of the following banks? Yogeshwar Datta was related to which sport? Agartala was the capital of which state? What is the current CRR rate? What is the name of River Cleaning Project? Which is the second most populated city? Buenos Aires was the capital of? Thambi Durai was related to? How many countries are member of SAARC? In FIFA 2014 world cup, Germany defeated Brazil by the score of? James Rodriguez was belongs to which of the sports? In which of the states does PM has inaugurated 44MW hydro power project? Vistara was the name of the new airlines that formed by which of the two companies?